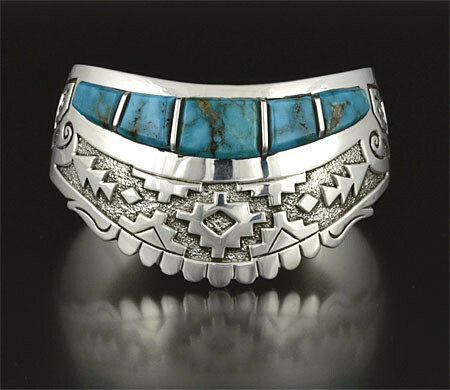 Sterling silver and Blue Gem turquoise cuff bracelet by Sampson Gray (Navajo) Sampson Gray was born in 1962 in Pine Dale, New Mexico on the Navajo Reservation into the Zuni Clan. 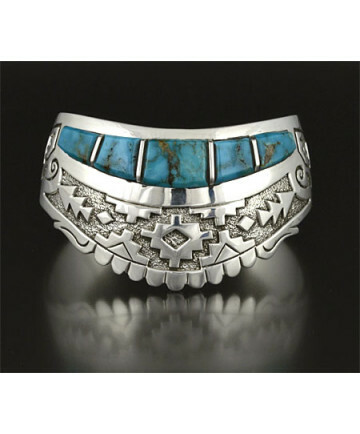 He learned silversmithing from his grandmother and has been active for 30 years. He uses a buffalo stamp and the letters "SG" to sign his work. This bracelet measures 1 1/2 inches wide by 5 3/4 inches inside circumference. Wrist opening measures 1 1/4 inches.